Silene noctiflora. 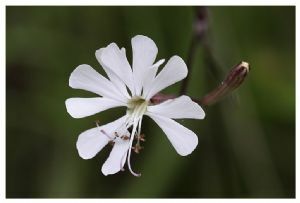 One of the several 'catch-fly' plants in the Campion family that attract adult moths to their nectar. It grows in fields and in other disturbed habitat. It is an annual herb producing a hairy, glandular stem up to about 75 or 80 centimeters in maximum height with a sticky texture. The hairy, widely lance-shaped leaves are up to 14 centimeters long and 5 wide, the largest ones located low on the stem. The petals are white to pink and each has two lobes at the tip. The flowers open at night and measure up to 2.5 centimeters wide when fully open. The flowers are fragrant. strips of 3 plug plants and seed available currently.